One of CalCAN’s top priorities for the year was to restore funding to the Healthy Soils Program and the State Water Efficiency and Enhancement Program (SWEEP), two Climate Smart Agriculture programs that had their budgets eliminated last year. We succeeded, with considerable effort by many of you, our coalition partners, who made the case to the Governor and to the legislature about the importance of these programs. But our collective success comes at much lower funding levels than what is needed to reach the majority of the state’s diverse farming community. In a deal with Governor Brown, this week the legislature finalized a package of climate change investments funded by cap-and-trade revenue. Combined with funding in Proposition 68 that voters supported in June (more on this below), this deal improves upon last year’s massive cuts to our key programs. CalCAN and our partners advocated for $25 million for Healthy Soils and $40 million for SWEEP. With the inclusion of Proposition 68 bond dollars, the programs will receive roughly half of what we believe is necessary for the programs based on farmer demand and scope of work. Disappointingly, the budgets of these past two years represent a shift away from transformative climate change programs. We also advocated for funding for a relatively new program aimed at reducing methane emissions from dairies and livestock operations. However, despite our calls for a specific funding allocation for the Alternative Manure Management Program (AMMP), the legislature has yet again left it up to the discretion of the California Department of Food and Agriculture (CDFA) to determine the funding split between the two Dairy Methane programs it manages: AMMP and the Dairy Digester Research and Development Program. Without clear criteria for how to determine the funding split we remain concerned that despite high dairy producer demand for AMMP, the bulk of the Dairy Methane funds will likely go to digesters as they did last year. The Sustainable Agricultural Lands Conservation Program (SALCP) is the only Climate Smart Agriculture Program with a continuous appropriation and it is not part of the annual budget process. 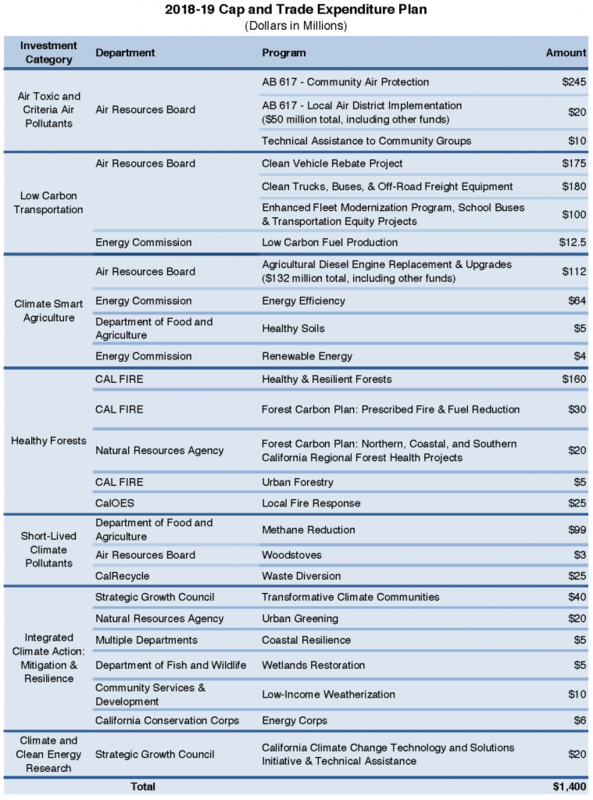 Sixty percent of California’s cap-and-trade funds are continuously appropriated to several climate change programs including High Speed Rail, Affordable Housing and Sustainable Communities, SALCP and others. The rest of the cap-and-trade funded climate change programs are decided annually in the budget process, including Healthy Soils and SWEEP. The package of annual climate change investments totals $1.4 billion with the majority of the funds going towards tail pipe emissions programs (e.g. zero emission cars, clean fleet incentives, etc. ), AB 617 implementation (i.e. toxic air pollutant monitoring and technical assistance) and conventional agriculture funding asks. More on that below. What were the budget dynamics this year? New this year was Proposition 68, a natural resources bond measure that was approved by voters in June 2018. It provides $4 billion in multi-year funding for parks, water infrastructure, climate change adaptation work, state conservancies and more. The bond’s passage, which CalCAN supported, is important for reinvesting in natural and working lands programs, but it also impacted this year’s cap-and-trade budget debate. There was a push by the administration and some in the legislature to limit natural and working lands climate change investments this year, arguing that the bond dollars were sufficient to cover these needs. However, the bond does not fund all the same programs as the climate change investment programs and cannot fund some important activities, including technical assistance. CalCAN and several of our allies in the natural resources community were able to argue for the inclusion of many of our programs in the final funding deal, but some programs did not receive cap-and-trade funding and must rely exclusively on one-time bond funding, including SWEEP. Another important dynamic, like last year, was that Governor Brown and some members of the legislature remained committed to funding $300 million in conventional agriculture trade groups requests from the cap-and-trade budget. We reported on this last year when a deal was struck between ag trade groups, the administration and legislative leaders to support the cap-and-trade program extension in exchange for $300 million in cap-and-trade investments, ultimately leading to cuts to Healthy Soils and SWEEP. Those same dynamics hurt our efforts to restore funding for SWEEP this year and kept overall funding for our key programs low. CalCAN staff will turn our attention to program implementation and outreach. In July, CDFA will release draft program guidelines for Healthy Soils and SWEEP. We anticipate the next call for proposals for the programs to go out in late fall, likely November. CDFA has open until June 28th a request for proposals for new practices eligible for AMMP funding. Lastly, we anticipate a robust round of awards for the SALCP, which will be announced at the end of this year. We are also turning our attention to the new Governor. CalCAN, with our advisors, is wrapping up our policy recommendations for the new Governor and will be reaching out to the campaigns this summer. Key among our priorities is robust funding for the Climate Smart Agriculture programs moving forward. And finally, we will ask you again to keep raising your voices to educate the legislature and the next Governor about the powerful solutions to climate change that sustainable and organic agriculture have to offer.